Often in spring, we're so concerned with preventing weeds in our lawn, we often overlook other areas of our landscaping where weeds love to hang out. And one of these favorite spots for weeds is your landscape beds. In your lawn, they must compete with your turf's root zones; however in your landscape beds, there is more room for them to grow and spread. Preventing weeds in your landscape beds starts in early spring, with a few simple steps. Round-Up Pre-Strike - While it may seem like overkill, chances are that some weeds have already begun to germinate and are growing in your landscape beds. It's important that you start the spring on a good foot, and control any weeds that have started growing in your landscape beds early. Round-up is a great product to use in your landscape beds to control these weeds. Becareful to follow exact mixing instructions on the product label and refrain from directly spraying any plants or shrubs. Accidental contact could cause damage, or even death, to the plant. Edge Your Landscape Beds - While this step may seem a little silly, edging your landscape beds can help keep grass and weeds from moving into your landscape. The best way to edge your landscape beds is with a flat spade, making a trench of 3-4" around your beds. This forms a physical barrier, keeping weeds and grass from creeping into your beds. Applying Pre-Emergent - The best way to control weeds is to prevent them. Similar to how your lawn care program has a crabgrass & weed pre-emergent applied to it in the spring, your landscape beds should receive the same treatment. Will control more than 40 different annual grassy and broadleaf weeds when applied according to label directions. 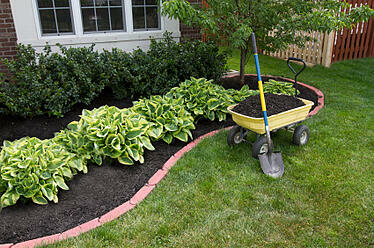 Mulch (Avoid Fabric) - Mulching your landscape beds is a great way to suppress weeds from growing. Applying a 3-4" layer of mulch in your landscape beds will provide a great barrier keeping weeds at bay. Landscape fabric is also a popular choice for keeping weeds from growing in your beds, however it can become unsightly after a few seasons. Landscape Weed Control Program - Finally, you might want to consider a landscape weed control program that will treat weeds in your beds throughout the season. These programs, such as Weed Pro's Landscape Weed Control Program, applies both pre and post-emergent weed control throughout the season, keeping your landscape beds weed free. Keeping your lawn and landscape looking great all season starts with a solid plan in the spring. Lucky for you that Weed Pro has put together everything you need to know to keep your lawn and landscape on track! The best part is that this guide is yours, absolutely free! To get your free copy, simply click on the button below!